Until a few years ago I did not participate in observance of the Lenten season. It was one of those traditions I had written off as an empty ritual from my childhood days in the Catholic Church. I feel the need to remind you readers that my intent is not to offend anyone by labeling Lent as an empty ritual. Rather, it is my intent, however, to be open and honest in sharing my story. My perspectives on religion from my childhood experiences are a big part of my story - a part of my story I am working to redeem as an adult. So, following the renewal and life I have found in observing Advent over the years, and choosing to follow the church calendar this year, I have decided that this year the Lent season would become a part of my journey. Through some discussion in the Advent Words community this past month I decided to do Lent Words in a similar fashion to how I did Advent Words. With some contributions from some of the members of the Advent Words group, I have put together a list of 40 words with a Scripture passage or two to accompany them. Lent is actually 46 days long, but in following the traditional mode Sundays are not included. The early church considered Sundays as non-fasting days. The word prompts are designed to 1.) get us into the Bible each day with words that are significant to this season of repentance and reflection, and 2.) help promote creativity as another way (or spiritual discipline) to draw close to God and participate in the season. You can choose to connect this word to whatever form of creativity you like - art journaling, collage, memory keeping, planner art, photography, poetry, painting - the creative practices to choose from are endless! You choose how you would like to participate. You choose how often as well! Follow this blog by putting your email address in the box in the right hand column. 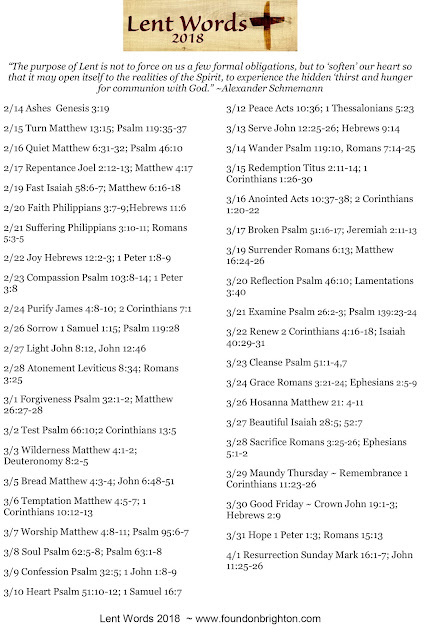 The full list of Lent Words is below. Then there will be blog posts at least twice a week through Lent sharing my art and my thoughts. Some of those blog posts will be from guests as well! Join the Lent Words 2017 Facebook group where you can share your art and ideas and join the conversation through the Lent season. www.facebook.com/groups/LentWords. Share on Instagram and other social media with the hashtag #lentwords2018. In the days before the Lent season begins reflect and prepare: choose the creative form you will use for your daily practice. Make a journal if that fits your creative form. If you would like to download a PDF of the word list you can do so here or access it in the Facebook group. In keeping with my plan to use one journal for the year, I will be putting my Lent Words art in my Everyday Journal. I am a part of a group for that as well! We are sharing our journeys and our art as we move through the year: Everyday Journals - Living Your Word of the Year. Great idea, but I don't do FB :-( Never mind, I'll follow you from here and maybe share on Instagram. Cath, please do follow from the list here and post on Instagram. We had a number of people who participated in the Advent challenge who are not on Facebook and they used Instagram and others from the group were able to interact with them there. I look forward to seeing how you create in response to the Lent Words! Cath, what is your Instagram name? Another wonderful opportunity from you Mary! Thank you! Yes, I want to participate. Since I already subscribe to your blog, is there anything else I need to do? Like you, I had never celebrated Lent until recently and it has been such a rich blessing to my live (same with Advent). Love being able to use my art with it. I appreciate you and all the ways you bless and encourage the gifts God put in me. I have thought about putting this in my everyday journal as well. So, I will set aside the pages needed to do so. Thanks for all the prep involved in this. Mary, Thank you for posting this! You have reminded me of a Lent season that changed my life in 2010 when I gave up fear for Lent. Every time I began to feel fear creep in, which was often, I would say, "No. Jesus I gave up fear for Lent, and I trust you because perfect love casts out fear." I continued the practice that year. After reading your post, I know exactly what I am going to give up during Lent this year: Doubt.